Celebrate Peak EIB at Our New Store! RUSH: I mentioned yesterday all kinds of new traffic to RushLimbaugh.com because of the app upgrade. I’m just gonna tell you, we are at peak membership, after, I don’t know, the website was kicked up mid-nineties or so, you would think that peak membership would be right then when the enthusiasm is high and so forth. But we’re at peak membership now. And thank you for that, by the way. On the app, on the website, Limbaugh Letter. As such, with all of this — and, by the way, there’s additional traffic on the website outside of membership, too, because there’s a lot of access on the free side. But the point is people are visiting the EIB Store, they have been, and they’re saying, “Why don’t you update this? There’s stuff that’s been there for years.” And I had to sadly admit that was true. We gave it no attention whatsoever for a host of reasons that I’m not gonna reiterate here. The point is that we’ve upgraded it now. 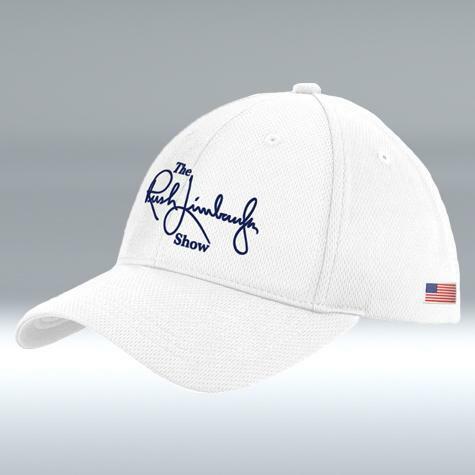 The entirely upgraded and revamped online Rush Limbaugh Show Store is up at RushLimbaugh.com. And I’m telling you this is purely due to popular demand. If there hadn’t been any popular demand, I wouldn’t have spent the time doing this, seriously. But the demand was there. We have restocked it. Everything in it is new. It is top quality, patriotic, carefully designed, as much of it resourced in the United States as possible. Cool new T-shirts. We’ve got great polos, golf shirts. I’m wearing one today. This one’s navy. We got a new logo, the Rush Limbaugh Show logo, not just my signature, not just EIB, but the Rush Limbaugh Show logo with the American flag. We’ve got personalized golf balls, golf hats. And, again, this stuff is top quality. The shirt that I’m wearing today has been laundered and cleaned probably 10 times, and it looks as new as it did when it was first worn. The caps that we have now are the highest quality caps that I think you can buy at the price point. They’re made by New Era. These are not flimsy, dirty looking caps. These are sturdy, these are strong, these are reinforced in the front part of the cap. I’ve loved New Era caps ever since I was a Los Angeles Dodgers fan and desperately wanted a real Dodgers hat when I was 15. I didn’t want a knock-off. I didn’t want something from the souvenir shop in the ballpark. I wanted the real thing so I did research as best you could when I was 15. That’d be 19, what, 66, ’65. I’m trying to find out who makes these things. And I found out eventually. The name of the company is New Era. They make all of the caps for every Major League Baseball team out there and a lot of the NFL teams as well. I even went to the Dodgers hotel in St. Louis at Chase Park Plaza when I was 15 and ran into the manager, Walter Alston, I asked him if I could get a cap. And he said, “No, go to the equipment manager, his name is Nobe Kawano.” He was a Japanese guy. So I went over to Nobe Kawano, “No speak English, no speak.” Blew me off. Of course. they can’t give out caps to everybody asking for one. But it was years before you could buy one. Back in those days official team stuff was not sold, jerseys, uniforms. Only the teams had them. The only thing you could get was a cheap replica. Well, that’s not the case anymore. And we’ve got white and navy blue caps. Baseball, golf, whatever you do. They’re sizable with Velcro, not cheap plastic on the back, and they’re made by New Era. Personally, I’m like a little kid with these things. I’m proud that we have them in the store. Anyway, you can see it all. We’ve got super fast shipping, super fast fulfillment, free shipping is part of our reintroduction here through June 14th, free shipping through June 14th. And of course we support the military, MC-LEF, the Marine Corps-Law Enforcement Foundation, a portion of sales from the store goes directly to them. 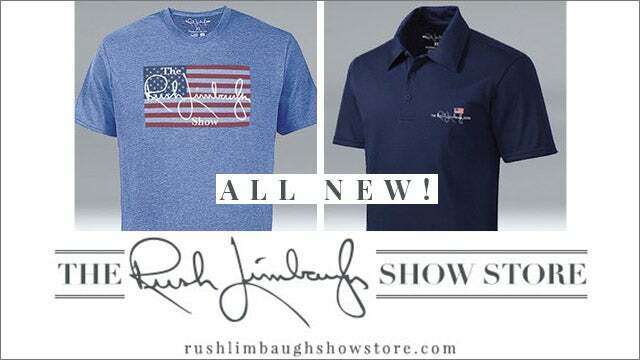 So the next time you’re visiting RushLimbaugh.com, stop in to the Rush Limbaugh Show Store. It’s been redesigned. The packaging that you’ll see when you receive stuff is all brand-new. You’re gonna love it. A lot of time has been put into the upgrade and to the design. We rolled it out last Thursday with a soft launch. Today is the second day we officially announced it and I first did so yesterday, wanted to mention it again today because it’s now got content and stuff. There’s golf tees, signature golf tees. I mean, there’s all kinds of little trinkets in there, T-shirts, you name it, every price point. The Rush Limbaugh Store at RushLimbaugh.com. RUSH: Brian, turn on the side camera here. I am wearing what I’m very proud of, the new cap that we have in the EIB Store. It’s made by New Era. It’s a substantial cap. I’m putting it on ’cause I want you to see this thing. This is not some cheap, little, flimsy, barely covers your head with a tiny little bill cap. This is the real deal. We got it at a great price point. 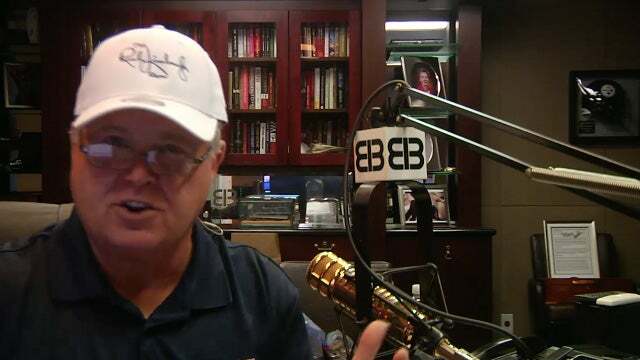 It’s at the RushLimbaugh.com store now, the EIB Store at RushLimbaugh.com, and I just wanted you to see it.